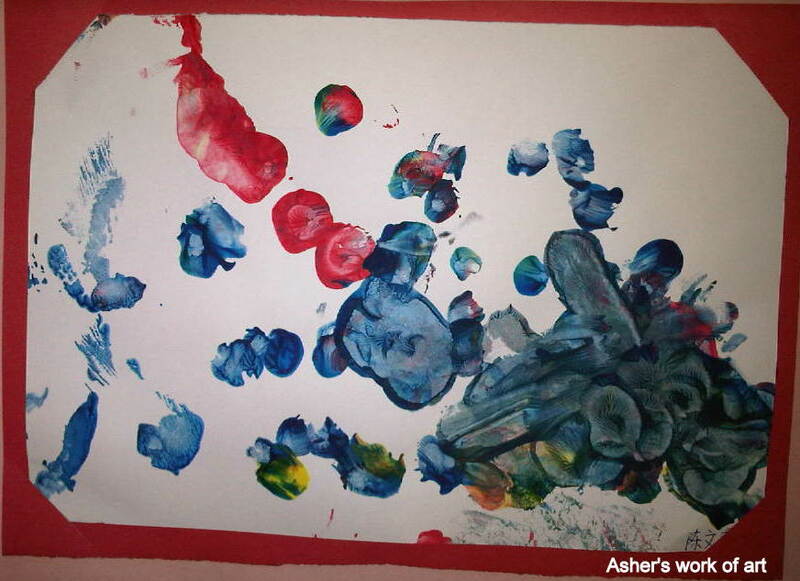 Asher's and Shawna's hand and foot prints. 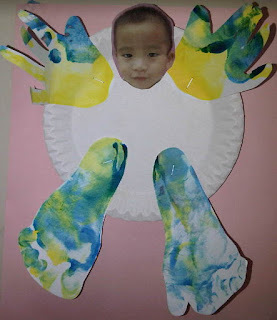 I'm praying that they don't turn out to be flat footed like Isaac and I. Those customised insoles sure don't come cheap! But they certainly seem to be helping (both Isaac and I are wearing them), so it's money well spent, in my opinion. Below is a chart that shows picture talk - I think the kids were shown pictures and they were supposed to describe what they see. 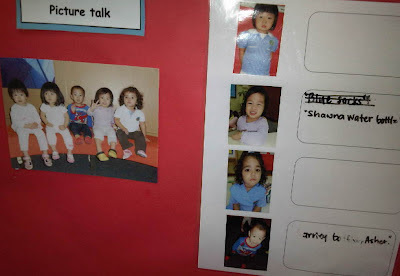 Apparently, out of the 5 kids in their class, only Asher and Shawna managed to actually say something about the picture. Shawna said:"Shawna water bottle." and Asher said:"Barney bottle Asher"
Friends whom we've met up with often comment that Asher & Shawna are very articulate/verbal for so young an age. Perhaps, I thought, but I recall Isaac even being more verbal that the twins are. Anyway, it's very amusing to hear them talk. 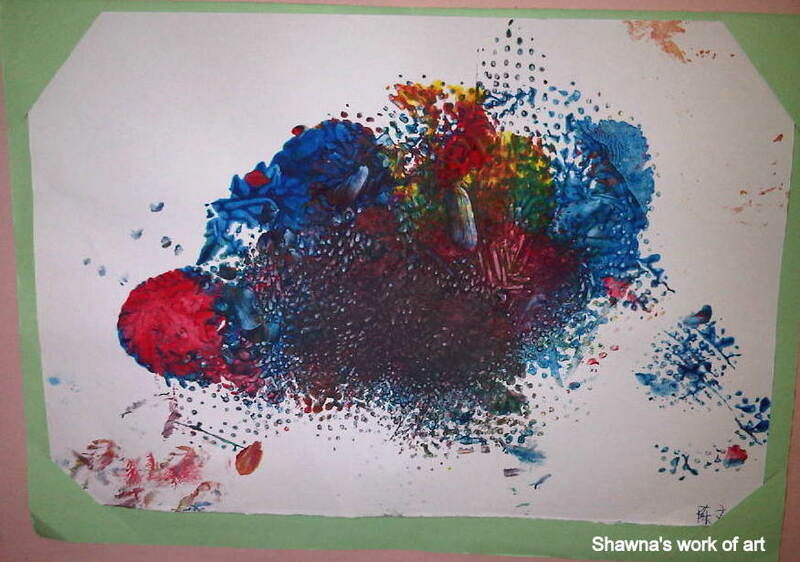 Below are Asher & Shawna's work of art. 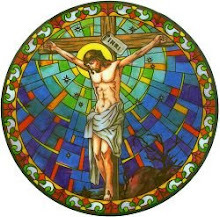 They were given balls (above) and paint, and just given free hand to create their own work of art. It's great that they do this in school. 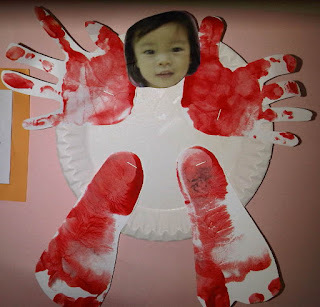 At home, we're usually too concerned that they'd make a mess of the house if we allow them to do such an activity. I know! We shouldn't think like that, but we can't help it! In any case, great that they get to do this in school. 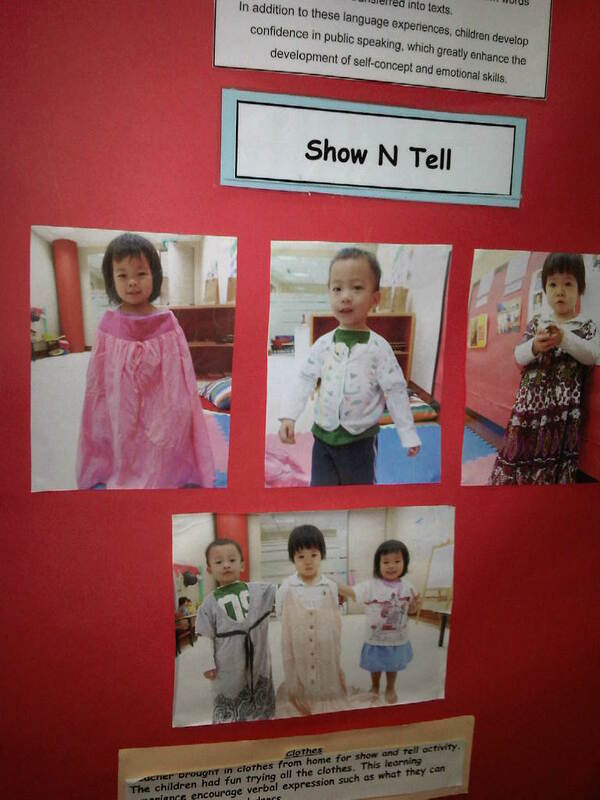 Below is apparently a documentation of a show and tell session of dress-up. Sooooo cute. It's quite a good idea actually, to just bring out some old clothes and let the kids have fun in it. 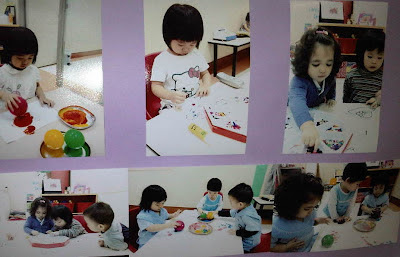 I love getting ideas from the childcare for stuff to do at home with the kids :) Particularly love it when I see such pictures, coz the kids are still too young to really verbalise and tell me what they do in school. So these are really great. 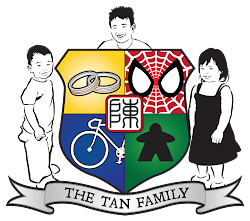 Appreciate the effort put into all the documentation! 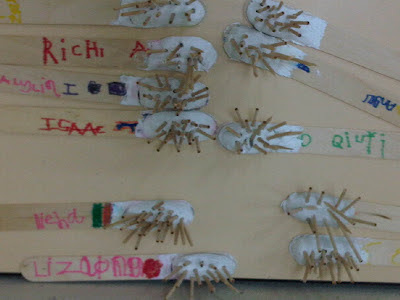 Once in awhile, I love to go into the kids classroom to take pictures of all these. So after the twins' class, I went over to Isaac's classroom to take the following pictures. This year, Isaac is in Kindergarten 1. Previously, in N1 and N2, he had the same classmates. This year, the school mixed up the two classes a little, so he has some different classmates this year. This could be why the teachers made them do this little "self-introduction" thingy above. I didn't realise my photo chopped off a bit of the left hand side of the paper... 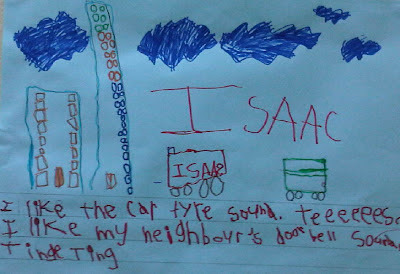 But basically Isaac wrote:"My name is Isaac. I am 4 yrs old. I like to eat chicken rice. 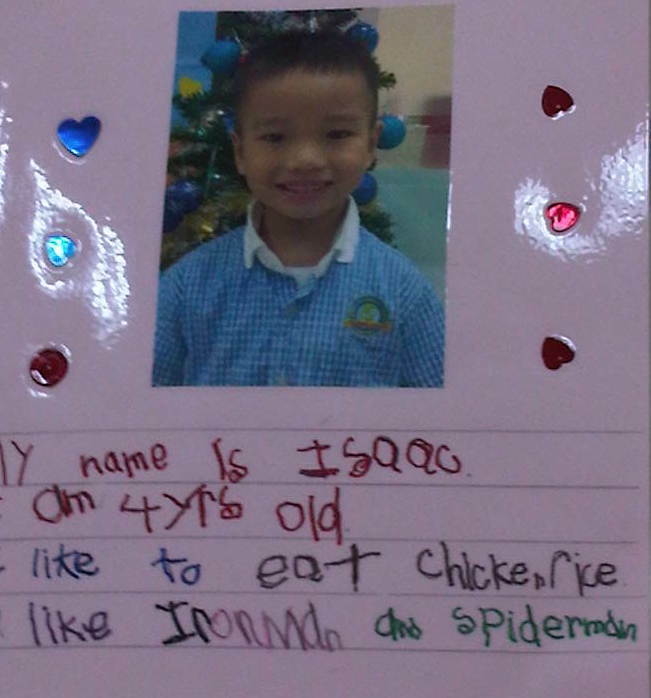 I like Ironman and Spiderman". 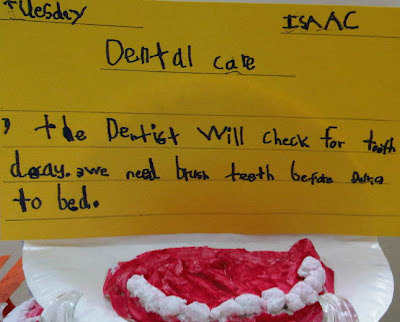 All the kids did a version of what Isaac did below. 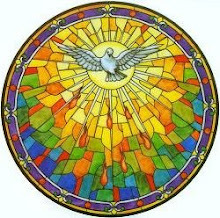 They drew some books and wrote words with the gist of what Isaac wrote above:"Do not bend the books. 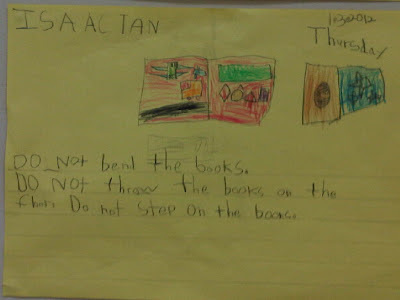 Do not throw the books on the floor. Do not step on the books." I didn't get a chance to ask Teacher Sharm whether she dictated the words to the kids, or whether they phrased it themselves. I suspect the kids phrased it themselves, becauseI saw one version that says "Cannot bend books. Cannot throw books. Cannot step books" from a boy whose English was below average. It's great that the school teaches such values as well.